Just five years ago in 2010, when we were all busy trying to surprise and delight, learning CSS3 and trying to get whole websites onto one page, we had a poster on our studio wall. It was entitled ‘Designers Vs Developers’, an infographic that showed us the differences between the men(!) who created websites. Designers wore skinny jeans and used Macs and developers wore cargo pants and brought their own keyboards to work. We began to learn that designers and developers were not only doing completely different jobs but were completely different people in every way. This opinion was backed up by hundreds of memes, millions of tweets and pages of articles which used words like void and battle and versus. Thankfully, things move quickly in this industry; the wide world of web design has moved on in the last five years. There are new devices, technologies, tools – and even a few women. Designers have been helped along by great apps, software, open source projects, conferences, and a community of people who, to my unending pride, love to share their knowledge and their work. So the world has moved on, and if Miley Cyrus, Ruby Rose and Eliot Sumner are identifying as gender fluid (an identity which refers to a gender which varies over time or is a combination of identities), then I would like to come out as discipline fluid! OK, I will probably never identify as a developer, but I will identify as fluid! How can we be anything else in an industry that moves so quickly? That’s how we should think of our skills, our interests and even our job titles. After all, Steve Jobs told us that “Design is not just what it looks like and feels like. Design is how it works.” Sorry skinny-jean-wearing designers – this means we’re all designing something together. And it’s not just about knowing the right words to use: you have to know how it feels. How it feels when you make something work, when you fix that bug, when you make it work on IE. Like anything in life, things run smoothly when you make the effort to share experiences, empathise and deeply understand the needs of others. How can designers do that if they’ve never built their own site? I’m not talking the big stuff, I’m talking about your portfolio site, your mate’s business website, a website for that great idea you’ve had. I’m talking about doing it yourself to get an unique insight into how it feels. We all know that designers and developers alike love an <ol>, so here it is. Now here’s where the definition of ‘build’ is going to get a bit loose and people are going to get angry, but when I say it’s never been easier I mean because of the existence of apps and software like WordPress, Squarespace, Tumblr, et al. It’s easy to make something and get it out there into the world, and these are all gateway drugs to hard coding! How it feels to be so proud that something actually works that you momentarily don’t notice if the kerning is off or the padding is inconsistent. How it feels to see your site appear when you’ve redirected a URL. How it feels when you just can’t work out where that one extra space is in a line of PHP that has killed your whole site. Not a better designer, it makes you a designer when you are designing how things look and how they work. Photoshop and Sketch just don’t cut it yet. Until you see your site in a browser or your app on a phone, it’s hard to imagine how it moves. Building your own sites shows you that it’s not just about how the content looks on the screen, but how it moves, interacts and feels. All the tutorials and forums in the world can’t beat your network of techie friends. Since I started working in web design I have worked with, sat next to, and co-created with some of the greatest developers. Developers who’ve shared their knowledge, encouraged me to build things, patiently explained HTML, CSS, servers, divs, web fonts, iOS development. There has been no void, no versus, very few battles; just people who share an interest and love of making things. When something is paid for, online and searchable then it’s real and you’ve got to put the work in. Buying domains has taught me how to stop procrastinating, but also about DNS, FTP, email, and how servers work. 8. The young people are coming! They love typography, they love print, they love layout, but they’ve known how to put a website together since they started their first blog aged five and they show me clever apps they’ve knocked together over the weekend! They’re new, they’re fluid, and they’re better than us! 10. It keeps you fluid! Building your own websites is tough. You’ll never be happy with it, you’ll constantly be updating it to keep up with technology and fashion, and by the time you’ve finished it you’ll want to start all over again. Perfect for forcing you to stay up-to-date with what’s going on in the industry. 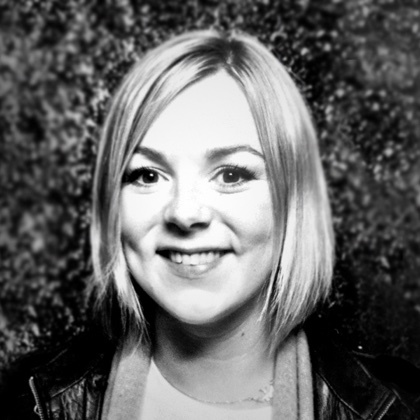 Ros Horner is a London based (print turned digital) Design Director and speaker, working on apps and websites for clients such as Adidas, Reebok, McLaren, and Volvo.